How do I find my Items? Mogan Shopping offers an incredible selection of items, divided into specialty stores and sellers across dozens of categories within each of our recommended malls. Our search engine is designed to enable streamlined searches across 6 recommended malls to find your desired item of choice! Simply enter your desired item name (English only), select your preferred mall and search. You can try each mall to compare the item from mall to mall. Mogan Shopping not only searches across many auction and shopping sites, it also streamlines the found items into a consistent format so that your shopping experience will be coherent and harmonious. We provide a summary page of the item, with the original page (in Japanese), below it. Translator tools are provided to help you understand the item better along with the option to send any questions to us via Q&A. The easiest and fastest way to find something in any of our stores is to use our search engine located at the top of each page. 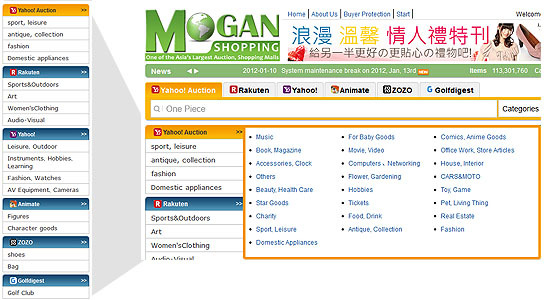 You can search throughout the entire Mogan Shopping site, or use our top-down categories to focus your search to a particular store. For specific searches, we encourage you to use our Advanced Search option. 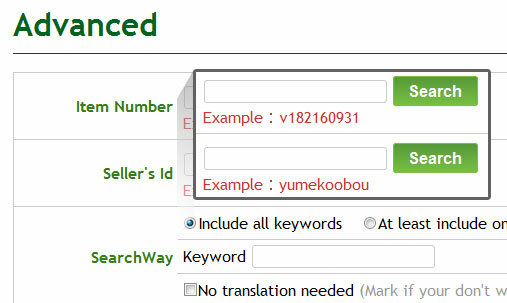 You can search by item name or/and related attributes of the item such as seller ID, keyword, price range, location, new or used, classification etc. You can also have the search results translated into several languages. There are various ways to navigate and browse our site. You can select one of our recommended auction and shopping stores then use the search engine to shop within that store. You can enter an item name, category or brand you wish to browse. The search engine will offer other search keywords to assist you. Alternatively, you can select any of the in-store categories listed on the left side menu of each store's main page. As you narrow your search, you will be assisted with various keywords to further assist your shopping options. The homepage also offer many additional ways to navigate and browse the site. You can select some of our themed shopping promotions or item highlights. If you were unable to locate your desired item from our recommended stores, you can still try our Mall Directory located under the 'Other' tab above the search engine. Once you find your desired item page, click on the the 'Add Track' button. This is like a shortcut link that you can collectively select your items to monitor or track. 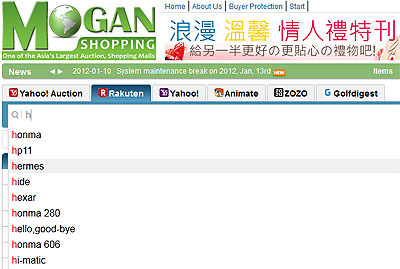 You can then view these items within your Mogan account 'My Account > Bidding | Buying > Watch List. For more details, please refer to 'How to Bid' or 'How to Buy'. You can find the most popular sellers from our recommended best-rated malls: Yahoo Auction, Rakuten, Yahoo Shopping, Animte, ZOZO and Golf Digest. When selecting an item, you will see a summary of the item along with your bid or buy shopping cart at the top of the page and the seller’s page embedded below (in Japanese). The summary is provided by Mogan Shopping and can be translated into various languages defined via the language link at the top of the page. Through Mogan Shopping, you will be able to shop across all our recommended and selected malls on one platform for your convenience. Most auction sellers are very well-known with excellent reputations and credit ratings across Japan’s domestic market. Mogan Shopping is committed to helping you find various popular researched categories, brands and stores. Furthermore, our buyer protection, fast service and reliable shipping to your door, allows you to shop with confidence and peace of mind.